In the conventional process, Mg-based alloy strips are fabricated by hot-rolling slabs prepared by direct chill (DC) casting. As the slabs are coarse-grained materials, a sophisticated rolling process has to be carried out carefully to fabricate much thinner strips. These repeated steps result in low production efficiency and high production cost. To overcome the difficulties associated with a solid state deformation process, a twin roll casting (TRC) process has been developed to produce Mg alloy strips directly from liquid Mg alloys. In recent years, a TRC technique has been developed extensively and lots of research work has also been carried out to improve our understanding of the solidification mechanism of TRC process. The conventional TRC process integrates casting and rolling into a single process and particularly stresses the large deformation in the hot-rolling process. The major problems with the conventional TRC process are coarse columnar grains of a size of approaching 1mm, severe chemical segregation at the center of the strip, large amounts of defects like bleeding and only casting dilute alloys with narrow freezing range. Most of such problems are created during the deformation process. In the TRC process, molten magnesium metal is heated to liquid temperature, flows down the cooling slope. The melt is rapidly cooled as it reaches the tip of the launder (nozzle). The slope is maintained at a constant temperature as an adiabatic boundary condition in the tundish. The melt is further dragged onto the surface of the lower roll from the tundish. Solidification starts immediately after the melt leaves the tundish, hence, in the TRC process, the tip sustains the melt at a constant level thereby improving the integrity of the solidified strip, minimizing the turbulence and distributing the melt to the required strip width. Due to contact with water cooled rolls, the melt solidifies into a continuous casting strip. The transformation from liquid to solid includes a semi-solid region. When the solidifying metal reaches adequate strength, determined by its ‘rigidity point‘, the material experiences a degree of hot working before leaving the roll bite. Therefore, the TRC process combines solidification and hot rolling deformation into a single process. A schematic diagram of the TRC process is shown in Figure 1. In the work of I.Bayandorian et al is presented the results of the investigation of the AZ31 magnesium alloy. The AZ31 is produced by twin-roll alloy strips process using the melt-conditioned twin-roll casting (MCTRC) and by a conventional twin-roll casting (TRC) process were processed by homogenization treatment, hot rolling, and annealing during and after hot rolling to give a final thickness of 1.6 mm before tensile testing. The homogenization treatment was undertaken in air at 623K, 643K, 673K, and 723K (350°C, 370°C, 400°C, and 450°C) for various times up to 6 hours, using carbon powder on the surfaces of the samples for protection from oxidation. The samples homogenized at 673K (400°C) for 1 hour were hot rolled at a speed of 190mm seconds–1 at 673K (400°C). The final thickness of 1.6 mm after a total rolling reduction of 73% was achieved by nine passes, with an approximately equal reduction of 14% for each pass. The strip samples were heated at 673K (400°C) for 15 minutes between each pass to restore the strip temperature and the ductility of the material. An annealing treatment at 623K (350°C) for 2 hours was given to the hot-rolled (73% reduction) strip. Typical optical micrographs of the microstructures obtained by MCTRC and TRC are shown in Figure 2. The polarized-light micrographs (Figures 2(a) and (c)), which include approximately one half of the strip thickness, show that the microstructure produced by MCTRC is uniform, significantly refined, and almost equiaxed throughout the cross section. In contrast, the TRC microstructure is dominated by a coarse columnar dendrite structure with large, equiaxed grains in the center and a thin, fine-grain chill layer at the surface. The average grain size of the MCTRC strip was approximately 74μm, compared with 616μm for the TRC strip. Extensive microstructural examination revealed that the MCTRC strip was free from severe centerline segregation, whereas macro segregation was found at most of the centerline of the TRC strip (arrow S in Figure 2(c)). The MCTRC strip also displayed a smaller secondary dendrite arm spacing (SDAS) than the TRC strip. 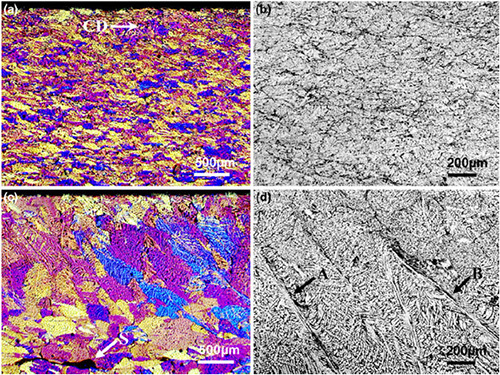 Figure 2: Optical micrographs of the as-cast microstructures produced by MCTRC (a) and (b), and by TRC (c) and (d); the polarized light micrographs (a) and (c) are presented to show grain structures and the black and white micrographs (b) and (d) to show features of plastic flow. This entry was posted in Magnesium. Bookmark the permalink.